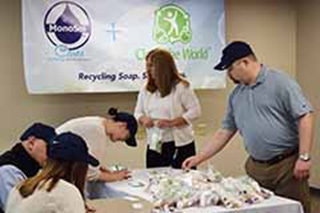 February 9, 2016 – MonoSol, the world leader in water-soluble films, is partnering with Clean the World, a non-profit enterprise dedicated to saving lives by distributing recycled soaps and other hygiene products from hotels to at-risk families. Today, MonoSol hosted a Clean the World Pack-a-Thon at their headquarters in Merrillville, Indiana, USA. Employees from around the world came together to assemble hundreds of hygiene kits, which were donated to local charities that serve those in need. Parents and Friends – a non-profit that assists the mentally and physically disabled, as well as the elderly, of La Porte County, Indiana. Their mission is to encourage and enhance the total personal development, independence and quality of life of these individuals with caring, well-coordinated community-based support. Ross Township Food Pantry – a food pantry in Merrillville, Indiana that offers non-perishable foods and sundries to residents of the Ross Township who are in need. Portage Township Food Pantry – a food pantry that assists families in crisis situations that live in Portage, Indiana. The Clean the World kits include 12 personal hygiene items such as a bar of soap, toothpaste, shampoo, lotion, a razor and more, along with a handwritten note from the MonoSol employee that packed the kit. MonoSol’s Corporate Social Responsibility (CSR) goals for 2016 are to promote safety, environmental sustainability, employee enrichment, philanthropic opportunities and continue the previous years’ CSR activities. In 2015, MonoSol generously donated funds to help support communities, arts, humanities, environmental concerns and implement the MonoSol Dissolves Hunger campaign. MonoSol employees have organized food drives, clothing drives and toy drives, prepared and served hot meals, packed foods at pantries and collected monetary donations. The organizations benefiting from these activities include the Food Bank of Northwest Indiana, Ross Township Food Pantry, Portage Township Food Pantry, Toys for Tots, State Street Community Church as well as Parents and Friends. Clean the World collects, purifies and recycles soaps and other hygiene products discarded by the hospitality industry and others. Through the distribution of these products to impoverished people, Clean the World works to prevent hygiene-related deaths and encourage vigorous childhood development while diverting product from landfills to improve global sustainability. From their recycling centers in Orlando, Florida, USA and Hong Kong, hygiene kit contents are sent to groups that volunteer to assemble them for donation to charities that serve developing countries and U.S.-based homeless shelters and others.